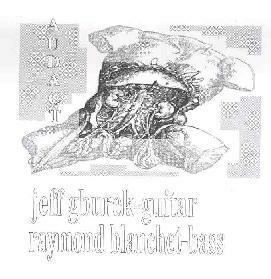 Jeff Gburek & Raymond Blanchet - "Audact"
Having relocated to New Mexico, guitarist Jeff Gburek has teamed up with bassist Raymond Blanchet to form a free-improv duo. Blanchet produces a wide range of sounds from his bass, which sometimes gives the music a chamber music sound and at others a free-jazz feel. Gburek explores a variety of styles, some at the more abstract end of the spectrum and others more accessible. Different sounds and moods are created through loving caress, playful manipulation, and violent attack. Overall I'd say this includes some of the most inspired playing and mastery over his instrument that I've heard from Gburek yet. The music on Audact can be quiet and reflective or busily brain shattering. The second (untitled) track includes a brief high volume assault segment that I enjoyed. Even while creating huge walls of sound Gburek and Blanchet's individual contributions can still be heard. There's lots happening here and much to reward the attentive listener. Definitely one of the better free-improv releases from 2002 I've heard and one that offers new discoveries with subsequent listens, the Gburek/Blanchet guitar/bass combination at all times offering the listener a challenging and uplifting earful.